Your left hand and arm are at extension of your putter shaft. The back of your left hand knows how to point and move at the target much better than the palm of your right hand. If you putt right-handed, your right hand will be more dominant. It will also be the one that can cause you the most problems in your stroke. Problems arise when you start to use it to guide or power your putting stroke. It should help and support your left – it should never control it. Much of the reason for your right hand wanting to dominate your stroke stems from ﻿how you grip your putter. With your right hand below your left it is in a stronger or more dominant position than when you putt cross-handed. To neutralise this influence some golfers putt with a left-hand low grip – others use a claw grip to prevent their stroke closing to the inside through impact. Many years ago Harvey Penick realised the importance of the left hand in putting. He wrote these words in his Little Red Book. "You should make it a habit to carry your putter in your left hand. Or in both hands, if you wish. But never carry it in your right hand alone. Your left hand and arm are an extension of the putter shaft. That is the feeling you want to have. I see pros on tour place the putter behind the ball with their right hand. Then when they put their left hand on the club, they automatically change their aim. Put your putter behind the ball with your left hand, or with both hands." Dave Stockton describing the part of his pre-putt routine when he steps into the ball states "Keep your eyes not on the ball, but on the line and the hole. Your left hand is on the handle in its basic grip position." Geoff Mangum of the PuttingZone explains the importance of your left hand by relating its use to how your brain functions in a cross-over manner. "If you putt right-handed, then on any given putt the only visual information that really matters comes from your left side – the area between your ball and the hole. 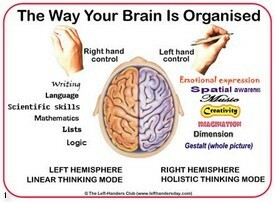 This information is fed to the right side of your brain, and it is this side of your brain that controls your left hand. Put simply, the back of the left hand knows how to point at the target and how to move at the target much better than the palm of the right hand." Changing a habit is never easy. However, changing to a simple habit that will help your putting makes good sense.